In a Hidden Cave: Imagine that you’re just bumming around a cave when you notice something shimmering in a nook of the cave walls. On a closer look, you realize you’ve found an ancient coin. That’s exactly what happened to spelunker (cave explorer) Hen Zakai when he was touring a hidden cave in Israel. Zakai found two silver coins from the time of the Roman Emperor Alexander the Great, who ruled a great swath of the Middle East nearly 2,000 years ago. The coins portrayed Alexander the Great on one side and the Roman God Zeus on the other. Along with the coins, silver rings, bracelets and earrings were also uncovered. Antiquities experts think that someone may have hidden the coins and jewelry during the unrest that followed Alexander’s death. Under the Sea: Another treasure find happened last year off the coast of Israel when divers just happened to spot shiny coins that they first thought were from a children’s game. 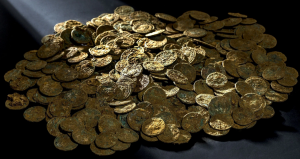 Instead, the nearly 2,000 coins were genuine gold coins from around 1,000 C.E. Most of the coins were from the Fatimid Caliphate, a Shiite Muslim empire that ruled much of North Africa and the Middle East in that time. Antiquities authorities think that the coins may have come from either a wrecked treasury ship delivering taxes or a wrecked merchant ship. In the Cherry Orchard: In Switzerland, a farmer found a huge hoard of more than 4,000 bronze and silver coins that date back to ancient Rome. The coins, which are about 1,700 years old, were spotted glimmering on a molehill in his cherry orchard. The coins weighed a total of 33 pounds and are thought to be the largest ever numismatic find in the country of Switzerland. While these coin finds are cool, what’s even cooler is that these modern-day treasure finders reported their coin trove to the appropriate authorities so that the coins could be well cared for and observed by the public. Until you discover your own treasure stash, keep collecting unusual gold and silver coins to fill your own treasure chest.